Justin Verlander took a shutout into the ninth inning and the Detroit Tigers held on to beat the New York Yankees 2-1 Tuesday night for a 3-0 lead in the AL championship series. 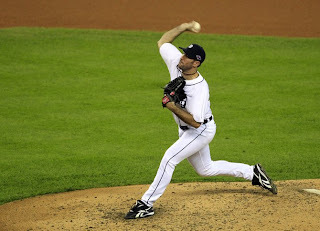 Phil Coke gave up consecutive singles with two outs in the ninth before striking out postseason star Raul Ibanez for his second save in two games. Verlander allowed only a pair of singles by Ichiro Suzuki and a leadoff homer by Eduardo Nunez in the ninth. Delmon Young hit a solo home run for the Tigers, and Miguel Cabrera had an RBI double. Yankees starter Phil Hughes was lifted in the fourth because of a stiff back, and manager Joe Girardi's lineup shuffle — Alex Rodriguez was benched again — failed to snap New York out of its untimely hitting funk. Detroit can complete a sweep and earn its second pennant in seven years Wednesday night when Max Scherzer pitches against Yankees ace CC Sabathia. The Tigers were on a historic pitching run even before their ace took the mound Tuesday. With the exception of a four-run ninth inning against Detroit closer Jose Valverde in Game 1, New York had been shut out for the entire series. Nunez's homer snapped a streak of 37 innings by Detroit starters without allowing an earned run, the longest in a single postseason in the live-ball era. Verlander fell just short of a second straight shutout after stopping the Oakland Athletics in the decisive fifth game of the division series. He struck out only three but kept New York off the scoreboard until the homer to left field by Nunez, the first run allowed by the powerful right-hander since he gave up a leadoff homer to Coco Crisp in Game 1 of the ALDS. Verlander got Brett Gardner on a tapper before he was lifted after 132 pitches, one shy of his career high set in Game 5 of last year's ALCS against Texas. Coke came in and allowed two-out hits to Mark Teixeira and Robinson Cano, with the latter snapping a drought of 29 at-bats without a hit. But Ibanez, who hit tying and winning homers in the same game in the ALDS against Baltimore and tied Game 1 of this series with a homer in the ninth, struck out swinging at a breaking ball to end it. Verlander, the reigning AL MVP and Cy Young Award winner, came within three outs of becoming the first pitcher in 24 years to throw consecutive shutouts in the postseason, according to STATS LLC. Orel Hershiser did it for the Los Angeles Dodgers in 1988, blanking the New York Mets in Game 7 of the NL championship series and the Oakland Athletics in Game 2 of the World Series. Valverde's meltdown nearly cost Detroit the first game of this series, but the Tigers were able to win 6-4 in 12 innings. Coke closed out a 3-0 victory in Game 2 and was able to hold on Tuesday in a tense final inning. Hughes matched Verlander in a scoreless duel until Young led off the Detroit fourth with a line drive over the wall in left field. It was his seventh homer in the last two postseasons — he's already the Tigers' career leader in that department. Five of those homers — in only eight games — have come against the Yankees. Andy Dirks followed with a walk, and Hughes was pulled with an 0-2 count on Jhonny Peralta. David Phelps came on and got out of the inning, but the Yankees now have a pitching injury to go along with all their hitting problems. Hughes allowed a run and three hits in three-plus innings. He walked three and struck out one. The Yankees kept it close, dodging several Detroit rallies. The Tigers added an unearned run in the fifth when Eric Chavez — Rodriguez's replacement at third — misplayed a grounder. Cabrera, the AL Triple Crown winner, followed with an RBI double. Cabrera has a 16-game hitting streak in LCS play, breaking a tie for that record with Manny Ramirez and Pete Rose, according to STATS LLC. But Cabrera hit into a double play with the bases loaded in the sixth, preventing the Tigers from adding more runs. ALCS - Here We Come! Feed Just One - GOAL MET!